Hillary Chybinski: teaching your kids about bullying. . .
teaching your kids about bullying. . .
are your kids in school? elementary? middle? high? then you are probably well aware that there is a lot of attention paid to bullying. we are very fortunate in our district, we have a formal program to teach and address the aspects of bulling. our district uses the Olweus Bullying Prevention Program. but as with many things - just because we can identify it and are instructed what to do should we encounter it - it doesn't mean we actually WILL - or that our kids actually WILL. 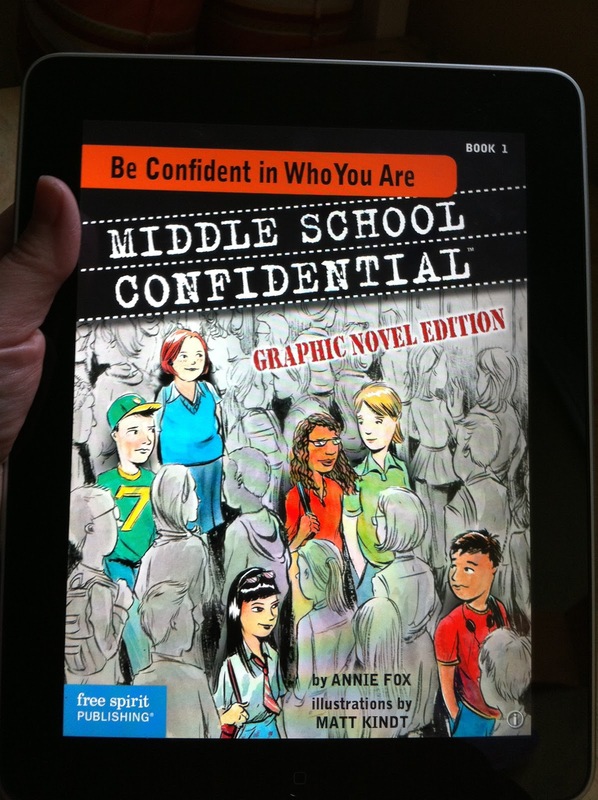 so when I had the opportunity to review Annie Fox's first iPad app for 8- 14-year-olds, "Be Confident in Who You Are: A Middle School Confidential™ Graphic Novel" - I jumped at the chance. i can remember my mom giving me articles to read when she was trying to make a point about something - rather than lecturing. . .it seemed to work better, even though I totally knew what she was up to (sorry mom). and by the way - she's still doing it! I gave the app to Ryan to check out - he's 10 and in 4th grade this year. I didn't look at it first - I wanted his impressions without any input from me. "I really like this story." "The pictures are really cool." "Mom, can I check out that App on your iPad again?" This sounds good right? I'd better check it out myself. . . It's got catchy music that plays and it's easy to operate. The graphics are modern and appealing to the eye. . .the content. . .RIGHT ON TARGET ! 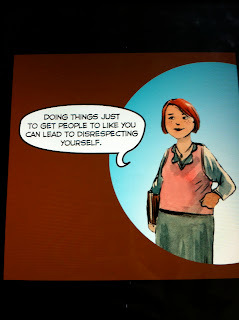 I am impressed with this graphic novel and the appeal to kids in the tween/middle school years. My 4 YO has sat with his older brother and looked through it as well - even though he's still too little to read it himself. With richly layered audio consisting of wall-to-wall movie-like sound effects and music, Be Confident in Who You Are makes full use of iPad technology. 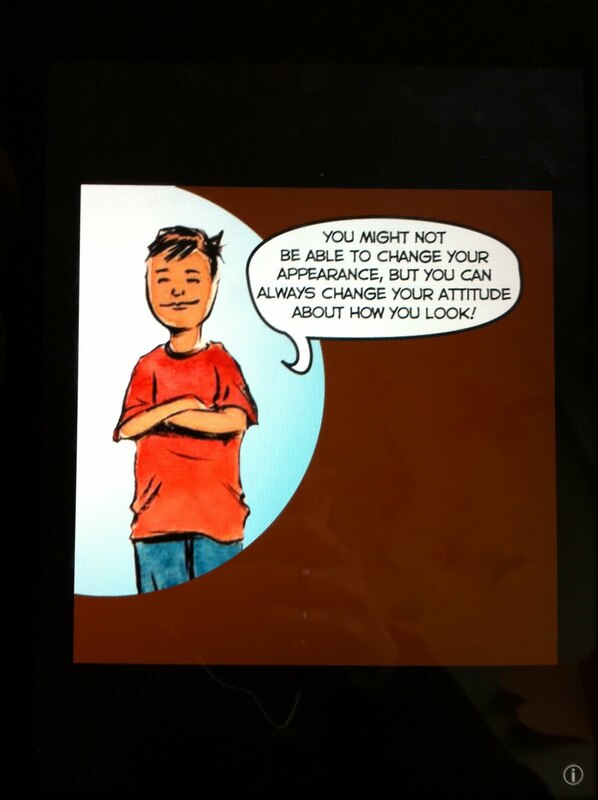 The app is designed for 8- to 14-year- olds, including those who aren’t enthusiastic readers. 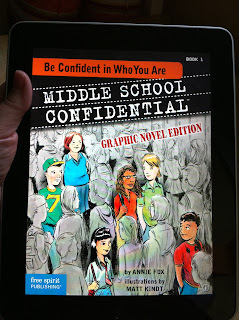 Be Confident in Who You Are is the first in a series of kids’ story apps to be produced by Electric Eggplant, the multimedia production company founded in 1992 by Annie and her husband, David Fox, both award-winning game designers. Designed in a format familiar to fans of Marvel and DC Comics apps, Be Confident in Who You Are enables the reader to interact with the story by zooming in for frame-by-frame reading or zooming out again for a page-by-page view. An auto-save feature remembers your place in the story and a menu page permits jumping to any of the eight chapters. Special Meet the Cast pages let young fans email their favorite characters and share their own stories. The app is designed for the hard-to-reach “tween” age group, reluctant readers, parents, and teachers who use technology in the classroom. Be Confident in Who You Are is $3.99 USD and available worldwide exclusively through the iTunes App Store in the Books category. Be sure to stop back and let me know if you checked it out and what you thought - I am constantly amazed at the new and inventive ways people are coming with to teach our children. note - I was provided with a code to download a copy of the app for purposes of my review. As always, all opinions expressed here are my (and in this case my son's) very own.